Well well well. Happy Wednesday you beautiful babes! To be honest, I wasn’t anticipating getting a blog post up with this week. Truthfully, with moving into the new house, some interesting work stuff, and all the rest of life’s normalcies, I was not anticipating getting a blog post up this week. But, as I was scrolling through, shopping per usual, I got struck with a blog post idea and had to write it up right away. Today is a simple one. Nothing crazy, but there are definintely some trends I am honing in on for Spring Break this year and I just had to share. I mean, what kind of friend would I be if I didn’t?!? Not a very good one, that’s for sure. And you all know that when I find something good, I HAVE to tell you all. Today is a fun one in that we get to talk ALL ABOUT SPRING BREAK. You remember those days? When you randomly got a week of vacation and I didn’t realize at the time just how good you had it? Ya. That break. Now, we may not all get an entire week off (kudos to those that do and I am jealous), but we all typically take some sort of vacation between now and June. Whether that be a quick weekend to the closest beach, a hop, skip and a jump over to Palm Springs for my California babes, or maybe even a nice weekend in some wine country…John are you taking notes? Regardless, we all do a litttleeeee something. 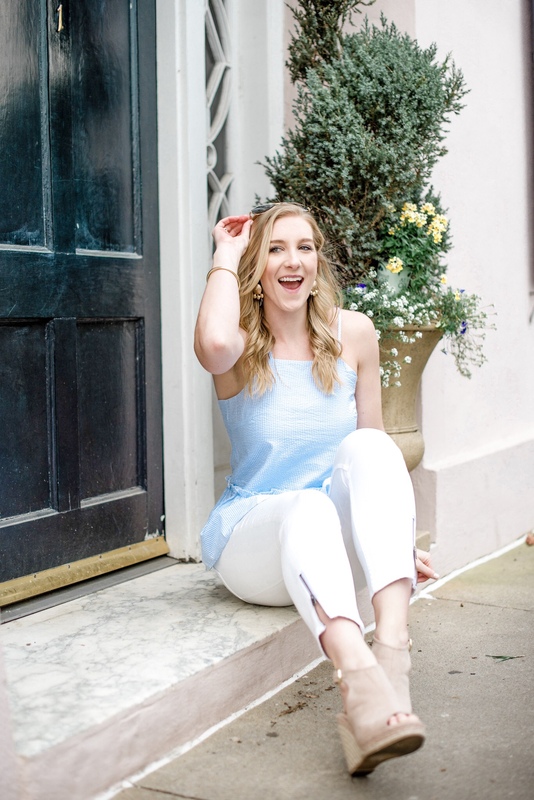 So today I decided to round up my gotta haves on that trip which will not only make your packing a cinch, but it will also highlight some more of those amazing Spring trends! Comfy Jumpsuit – Okay, first and foremost, you have got to get yourself a good jumpsuit for your Spring vacay. Whether it be for traveling, throwing on for a casual day exploring, or even dressing it up for dinner. A good and comfy jumpsuit is a must and the best thing of all is that there are so many good ones out right now! I personally just bought this one, but have been eyeing this one and this one for some time! Romper – Okay, now I know this is very similar, but it is by no means the same thing. A romper is another piece that can be super versatile, is easy to pack, and just needs accessories to give different variation to it as an outfit. I like that I don’t have to think when I wear a romper or a jumpsuit, which is why they are both on my list. You all may have seen this one on my Instagram and it is definitely one of my favorites for a Spring adventure (feel free to use code TheChicDelight15 for 15% off your order!). However, in typical Melissa fashion, I also have my eye on a few others. Including this red one I featured in stories and this striped one. Jean jacket – Now that you have two super easy and versatile outfits (which can probably make up to 5 different looks), you will need a good jacket to go over them! I recently bought a jean jacket and have been in love with it. It is so easy to wear and goes with so much. Not only could you style it with your jumpsuit and romper, but even just a t-shirt and pair of shorts, or throw it over a good cover-up! Super easy, perfect to wear on the plane or pack, and will be your go-to for all of your vacation needs! I just bought this one, which is currently on sale for $53 which blows my mind because it is such good quality. In fact, when I purchases it, the sales associate informed me it was the best one the store has had since last season! Done and done. Prior to finding the one I bought, I was definitely eyeing this baby. A bit pricier, but a good jean jacket will last you for years, so find one you love and remember you won’t have to buy another for a while! A good hat – I love a good hat. Now, they are annoying as all get out to pack (let me know if you need a tutorial on this), but a good hat just makes a trip in my mind. I picture you, lounging pool or beachside, sipping on a yummy drink, wearing a cute hat and basically living the dream. Now, next time, just don’t forget me! Geez. But in all seriousness, here are my faves: here, here (this one is very similar to the one I own), and here. Sunscreen – always a must. Skin damage happens all day, every day. Truthfully, you should be wearing sunscreen everyday, (SPF of at least 30), but given you are going on an adult Spring Break, you 100% should be bringing some good sunscreen. This brand is hands down my favorite. My favorite product of theirs is definitely their setting spray and their antioxidant sunscreen, but regardless, just make sure you are protecting the largest organ of your body! Espadrilles – I love a good pair of shoes you can wear with every look. I think that a good pair of espadrilles is perfect for every look you will be rocking on vacation, as long as the are comfy! Typically, given that it is more a platform and gradual heel, they are, which makes buying a cute pair even more fun! I recently just purchased this pair, from another boutique actually, but, was luckily able to find them fully stocked from the one I linked. A few other pairs I really love are this one and this one! A cute swimmie – I mean…we can’t have an amazing vacay without one. Obvi. So here are a few I have been drooling over. This one, this one, and this one are by far my favorites and are super affordable! A good Spring bag – I feel like I have always wanted to splurge on a fun Spring and Summer bag, but never do. This year, I am pulling trigger. Here are the ones I have my eye on: 1, 2, 3, and 4. A cute spring dress – lasting and most importantly, is a fun Spring dress. This will be perfect for dinners, grabbing a drink at the bar, or even exploring on your vacation. I personally am totally in love with this one, this one, and this one! I hope you all enjoyed this post and I’m sorry I’ve been so MIA. Life definitely got the best of me the past few weeks, but I can reassure you, that things are settling right back down! Comment below with any questions and I can’t wait to see what you all get for your Spring vacays!